What is Adaptive Asset Allocation™ (AAA)? How do FAA performance results compare to Horizon's™? How do I know the Horizon model and results are valid? Is Horizon™ right for everyone? Is Horizon™ an aggressive or risky strategy? Is Horizon a "Market Timing" strategy? Asset allocation is an investing strategy whereby you diversify your portfolio amongst the various kinds of possible investments. Investment choices are categorized according to which ASSET CLASS—stocks/equities and bonds/fixed income—they belong. For example, during recent severe down markets (2000-2003, 2008) an FAA strategy would have required that you hold a large percentage of your money in stock funds—losing money for the entire 3-year period. During each subsequent market recovery, an FAA approach would have a large percentage of your portfolio invested in bond fund alternatives—even though they historically lose money in strong up markets—resulting in severely reduced growth. Unlike traditional asset allocation strategies that have been popularized by Target Date Funds, Life Cycle funds and managed accounts, Adaptive Asset Allocation™ does NOT follow a preset formula. Instead, AAA seeks to have your portfolio consistently invested according to how the market and economy are performing, i.e., your funds are always best positioned to work WITH, not AGAINST, the market's prevailing direction. As it becomes evident that an upward moving market has leveled off and started to decline, an AAA strategy would begin to shift money out of stock funds and into bond funds. During a sustained down market, there will come a point where an AAA model has moved ALL investments into bond funds, thereby protecting the portfolio against sustained loss—losses that could take years to recover from. Horizon™ is a computer model, consisting of millions of calculations that analyze a finite collection of mutual funds such as you would have in an employer-sponsored retirement plan or IRA. These calculations mathematically determine which fund choices are best aligned with current market conditions. Horizon™ analyzes and suggests adjustments to your portfolio's fund holdings using an objective process that yields outstanding results. The output of the model, along with simple-to-use reallocation instructions, are made available to subscribers via the Horizon™ Action Report that is updated every 5-weeks. The Horizon™ Model Portfolio, included in every Action Report, lists each available fund in your portfolio, and shows the exact percentage of the portfolio that is being invested in each one. 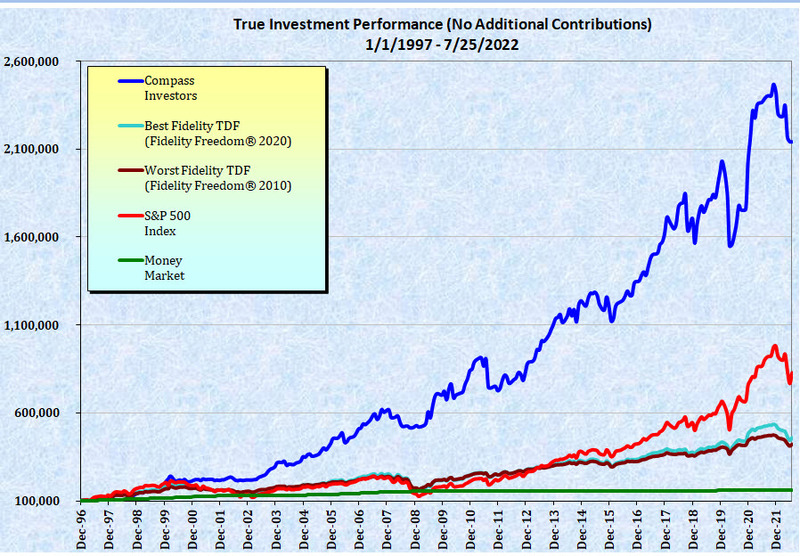 The 13-year history of Horizon™ demonstrates investment returns that are 2.3 TIMES HIGHER than the BEST performing professionally managed target date retirement fund, all of which follow a traditional asset allocation approach. Due to the extraordinary effect of compounding, this higher investment return results in portfolio values that are 300%+ GREATER. Horizon™ is a self-managed approach that requires a commitment to review and possibly reallocate your investments once every five weeks. Once you become comfortable with it, according to 97% of our subscribers, the entire process should take less than 10 minutes each time, or only about 2 hours a year. Yes, it does require this minimal amount of your attention, but the reward for creating your own Retirement Income Security is priceless. When someone asks about “risk” they are typically referring to investment risk, or in other words, the amount of fluctuation you are willing to accept in your portfolio’s performance from one year to the next. Investment risk is defined on a continuum from “conservative” (most of your money in bonds and cash and therefore little fluctuation) to “aggressive” (most of your money in stocks, high fluctuation). Because of the adaptive nature of Horizon™, the investment risk changes depending on what the market is doing. So, for example, when the market is clearly going up, Horizon™ may be 100% invested in stocks and therefore would be labeled “aggressive.” And the opposite is true during extended down markets when Horizon™ will likely be 100% invested in bonds and cash which would be considered very “conservative” from an investment risk perspective. However, there is another risk that we encourage people to consider called Retirement Income Security risk, or how likely you are to run out of money before you die. There are few people who are willing to take an “aggressive” posture here. Because of the significantly higher long-term investment returns that Horizon™ delivers, we can safely say that your risk for running out of money before you die is substantially reduced compared to any other investment strategy. Horizon™ Adaptive Asset Allocation™ offers the most desirable ratio of investment RETURN to investment RISK resulting in the lowest Retirement Income Security risk because your investments will always be positioned to work with—rather than fight against—the changing tide of market and economic realities. Preserving more of your portfolio's value in a severe down market. Studies have shown that the worst thing you can do is NOTHING. Inaction will ultimately yield the lowest result and practically ensure you are taking the maximum risk for running out of money during retirement. In summary, the Horizon strategy is not focused on "aggressive" growth; it is focused on achieving OPTIMIZED performance.